Second from last for a reason - I get to put it all together. 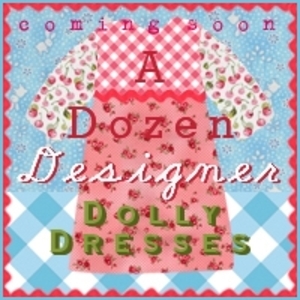 Those of you who know me will most likely understand the yoke on this dress. I may be big on machines, but there is a love of the hand-made-itsy-bitsy in me. The technique is North American Smocking. It's unlike traditional English smocking. The finished product has no elasticity, and is usually worked on a straight checked fabric. The fabric here is printed on the diagonal and produces a straight basket weave. Honestly I don't know what comes over me sometime, just thought it would be cool. All you need to know to do this is tie a knot with a needle. The dress pattern had a smocked dress look to me (the whole fabric collection too), so I fiddled a bit with a few ideas. 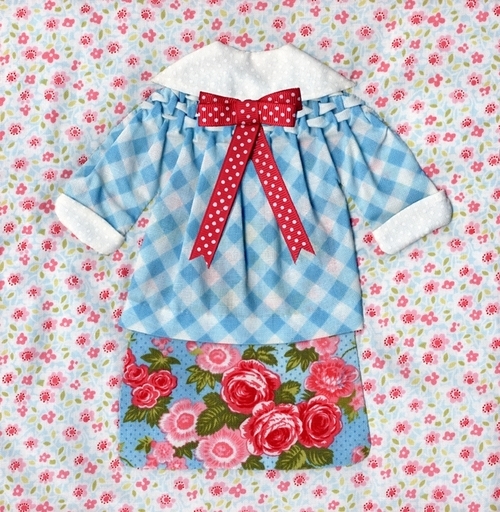 This type of smocking seemed better suited to applique. Now since Tim Holly lives a hop skip and jump from me you know I had to "work it". She was even kind enough to make me the pretty poet's bow. Now if anyone is actually interested in the technique I would be happy to post further - just leave me a comment. Sometimes group projects are so cute I can't resist. I used to really hate binding quilts. Corners came out cupped or dog eared. When I jumped into quilting for hire I had to get it right. Most directions allow for 1/2" finished without problems. Wider than 1/2" and I was in trouble. So I had to sit down and figure out how to consistently turn a corner with any finished width binding. I am going to assume that readers know how to fold a corner. The point I want to make is - do you know where to put the fold. Most directions tell you to line it up with the edge of the quilt. I do mark the finished perimeter+1/4" and make 1/4" corner marks so I know where the finished corner is. 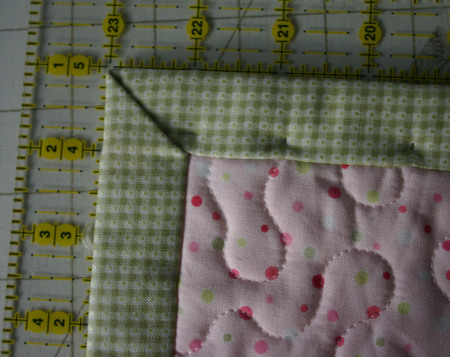 We all sew to within 1/4" of the corner and back-tack. My little 1/4" line is my guide to stop and back-tack. 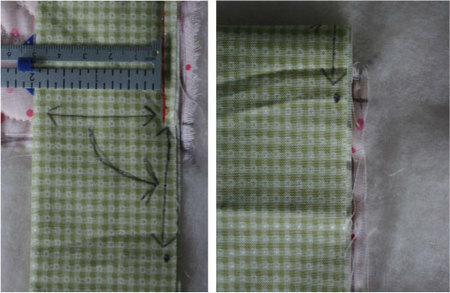 To put the right amount of fabric in the corner I measure from the seam to the fold of the binding. That measurement is transferred along the seam line of the binding and I mark a dot. The binding is folded as usual and the dot goes right at the corner, using the corner mark. The images are of a 1" finished binding, cut width is 4 1/2". I begin sewing the next side at the fold. Cut the quilt layers after the binding is attached. Have a peek at Holly's latest quilt. Holly can't possibly sew every quilt she designs and keep up with business. She found me about 4 years ago. How she did that I won't ever figure out. I was just starting out with my longarm business. 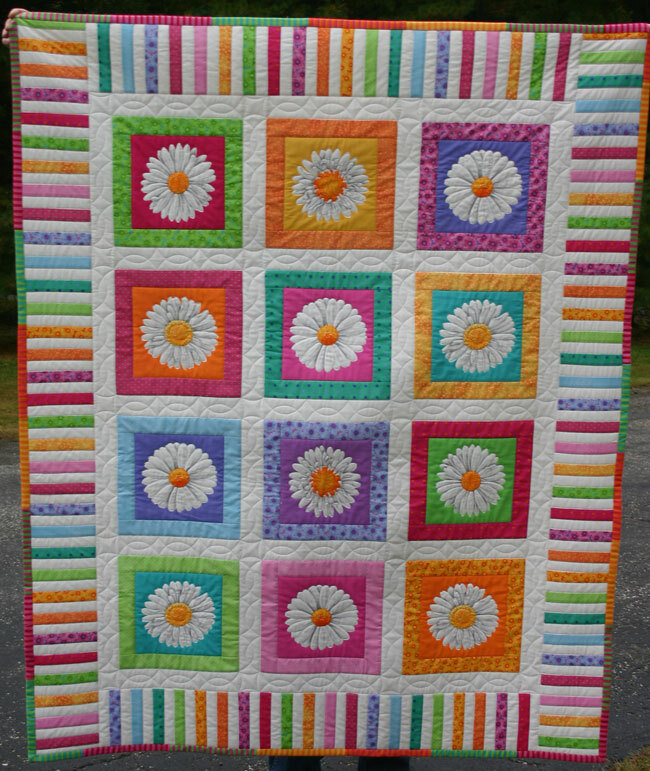 She was down close to the wire for the Pittsburgh Market and needed the "Candy Machine" quilt finished. Holly is constantly designing quilts from her fabric line. This is one from a market or two back, I can't keep track. 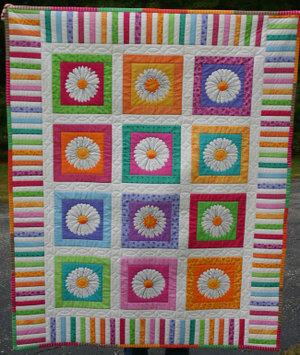 Four years later, another market, and this fun daisy quilt was one of the projects I whipped up for her. I just love piano key borders. Contents of this weblog are the property of Cheryl Winslow, so be fair. Ask in writing before using anything found here.